San Francisco residents Chris and Meghan wanted to feature some of the City by the Bay’s signature attractions for their two-piece suite, including a cable car and San Francisco City Hall, the beautiful site of their ceremony. They also requested some familiar wedding motifs, such as doves holding a banner, a sweet portrait of the couple, and a polite custard palette. A delicate blotted contour line and graphic blocks of dusty pink and rust red kept these elements fresh and whimsical, and the inclusion of oversized dahlias—the couple’s favorite and the official flower of San Francisco—added a personal touch. 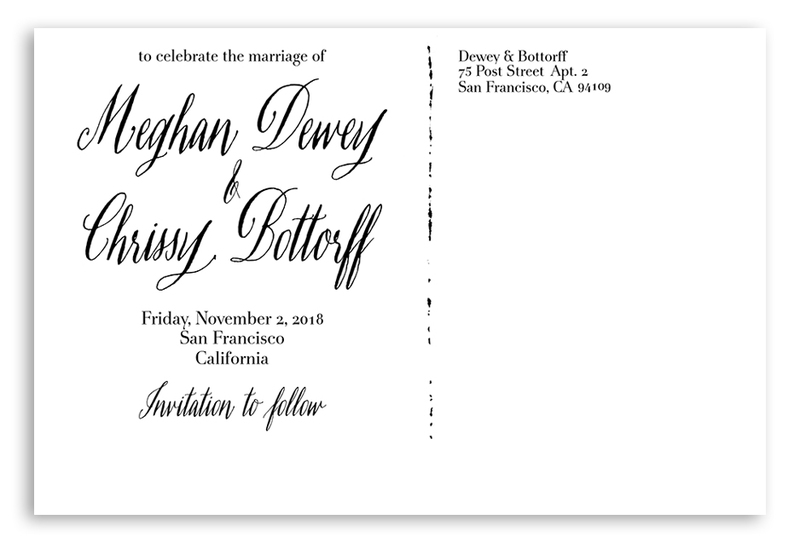 I hand-calligraphed the text on the save-the-date, and chose similar and complementary typefaces for the reverse of both pieces.